Locked away, but not silenced... Maryam Rostampour and Marziyeh Amirizadeh knew they were putting their lives on the line. Though Islamic laws in Iran forbade them from sharing their Christian beliefs, in three years they'd covertly put New Testaments into the hands of 20,000 of their countrymen. They'd started two secret house churches, including one for prostitutes -- many of whom were women abandoned by their husbands with no other way to support themselves and their children. Maryam and Marziyeh had almost been caught so many times that it felt like divine intervention. But finally -- perhaps inevitably -- the two women were arrested in 2009 and held the notorious Evin Prison in Tehran. There, inmates are routinely tortured, and executions are swift and sudden. But in the face of chilling interrogation, intimidation, and a possible death sentence, something remarkable happened. Instead of succumbing to fear, they chose to take the radical -- and dangerous -- step of sharing their faith inside the very walls of the government stronghold that was meant to silence them. 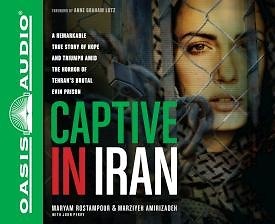 In Captive in Iran, Maryam and Marziyeh recount how God used their 259 days in Evin Prison to bring about a miraculous reversal: shining light into one of the world's darkest places, giving hope to those who had lost everything, and showing love to those in despair.